1. Adding your name in senders box. In order to add your individual name you have to click “Add Sender Name” field in Settings -> Sender names which is accessible after you log in to the system. 2. Multi sms sending (typing numbers). To send large amounts of messages please select SMS -> Gate -> Fast Gate in your panel. In field “Sender” you have to select an active sender name (added according to point 1). In field “Recipients” you have to type all numbers separated by comma “,”. Common message content has to be written in a “Content” field. 3. BULK /MASS SMS sending (numbers loaded from file). Don’t forget to add a proper country prefix before each number. The content of the message has to be identical for all messages. If you want to send a separate content for each number please read point 4. 4. BULK / MASS SMS sendig with separate contents (numbers and contents loaded from file). 30123456789;Individual message content. Code 1213. 30123456780;Individual message content. Code 4321. 30123456781;Individual message content. Code 5436. Attention! CSV files should be created by “save as” option in CSV generating programs (Open Office, MS Excel). If you cannot create this file using proper software you can create it on your own but you have to remember to separate each field by semicolon “;” and quotation marks for each row. This operation is automatically performed by designed software. 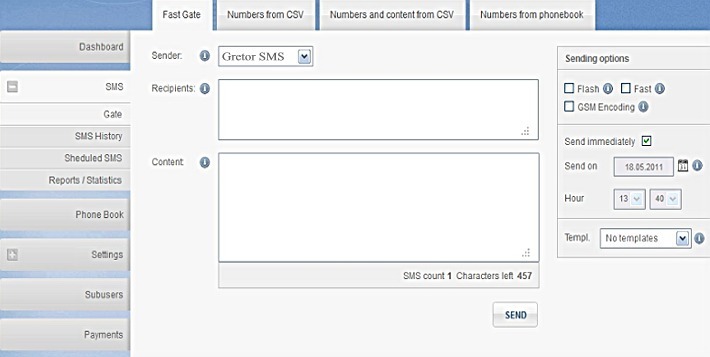 To send large amounts of messages please select SMS -> Gate -> Numbers from phonebook in your panel. In field “Sender” you have to select an active sender name (added according to point 1). In field “Recipients” you have to select group of contacts from your phonebook to which you want to send messages. To create a new group please select “Phone Book” in your panel. To add a group click “Add new group” and enter the group’s name. To add a contact to particular group in your “Phone Book” panel click “Add contact” enter the contact name and select parcitular group from the list on the right. In content field please write the same content for all messages (check points charges table).